Stenciled concrete is a great option for traffic areas that need to look great and perform well with minimal maintenance issues. 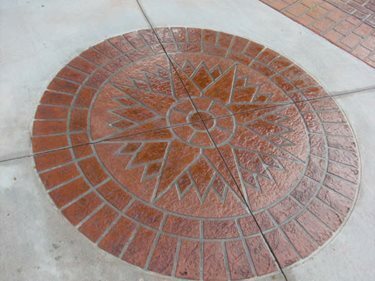 Todd Rose of Todd Rose Decorative Concrete recently sent us photos of a job that called for stenciled concrete. 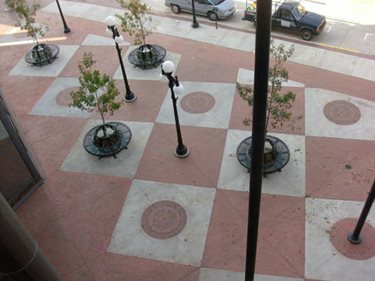 Installed in Sioux City, Iowa for the Terra Center, this business courtyard was originally designed with brick pavers. Because of the many maintenance issues that can accompany brick pavers, the courtyard needed a surface that produced a similar look but with longer lasting results. Todd Rose Decorative Concrete used a herringbone brick stencil and running bond stencil for the new concrete surface. "We also had five compass stencils," explains Rose, "which we acid stained to give them a different look than the other areas." 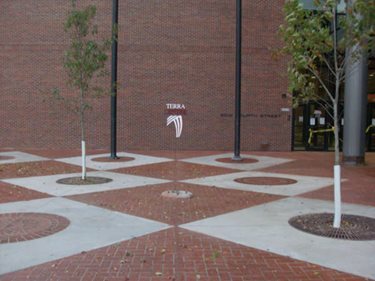 In this case, stenciling concrete was the most viable option for the courtyard to maintain its unique look, and to eliminate the maintenance issues.